Just off of the living room and kitchen is a small ‘half bath’ guest bathroom. And if you can picture the space underneath a stairway… then you will know how TINY this room is (and therefore impossible to photograph!). 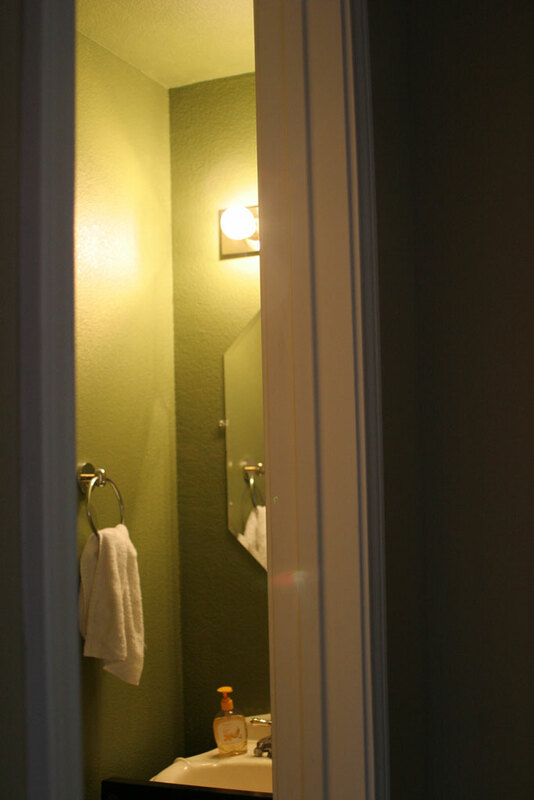 And to top it all off the previous owners had chosen a color that was a very unattractive shade of green (it might also be that i’m not a huge fan of green… and I was a bit biased against their other green choices in the house) and painted THE WHOLE ROOM… ceiling and all. Doing so made this tiny little room feel even tinier! And with a builder grade octogon shaped mirror, I knew a little bit could go a long way in this room. And this was definitely a room I did a little bit at a time. One weekend I got fed up with the mirror… and switched it out. About 6 months later I decided the ceiling needed to be white. And somewhere around that time I found a glass bowl for a sink at the Habitat ReStore for about 50$. Since I’d always wanted an above the counter glass bowl sink, I went ahead and bought it with ABSOLUTELY no idea what the next step in how to actually make it function as a sink. 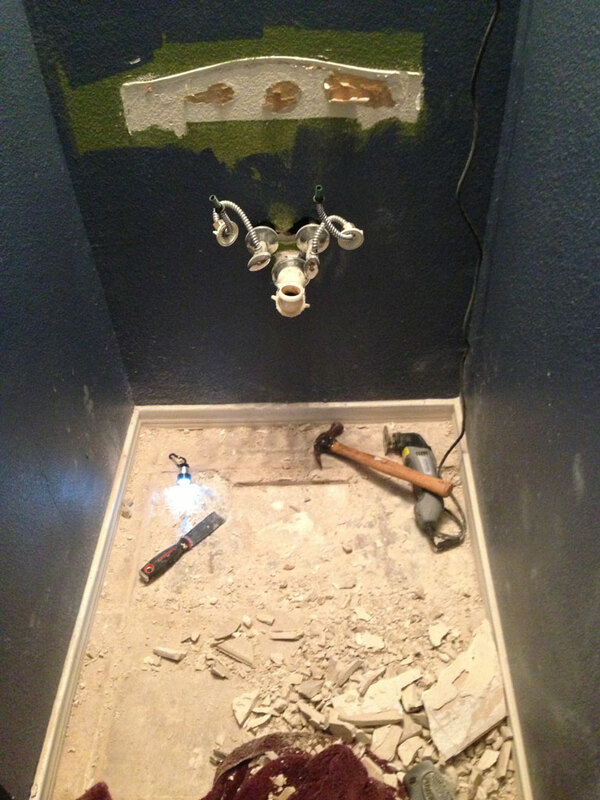 And so… like the tile in our Backsplashing Project it sat in my garage for a LONG TIME. But I knew if I could figure out how to convert it into a sink it would look PERFECT in this location. And then a few other pieces of the puzzle fell into place. I was perusing faucets on overstock and found one that was perfect at a deep discount and when I looked closer it mentioned it had the sink stopper to go with it! I immediately purchased it and added it to the now growing stack of sink materials in my garage. 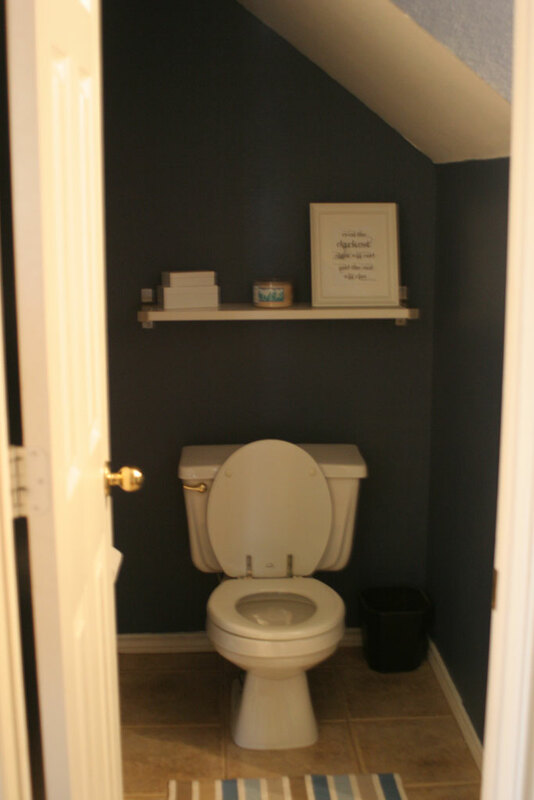 The other piece that fell into place was realizing that the old record holder which was sitting in my garage awaiting its furniture destiny was the exact right size to fit in that little corner of the bathroom AND the sink and faucet could comfortably sit on top. You would think with all the pieces I would jump right in… but life has a tendency to get in the way and all these pieces sat in my garage. Party because I didn’t have any time… and partly because I was scared to start, I mean lets be real… if this goes wrong it means I have a leaky sink and plumbers ARE NOT CHEAP. I like the picture above because it gives a very good picture of the old paint color vs the new paint color. I decided to paint so spur of the moment that I just mixed my own paint using leftovers from the kitchen, living room and office paint jobs to find a happy medium. Which is a little sad because I LOVE this color and wish I could use it in more places! I might have to get it color matched sometime!! Since this post is getting a bit long and unwieldy I’ll save talking about how we converted the old record holder into a bathroom sink for Friday’s post. 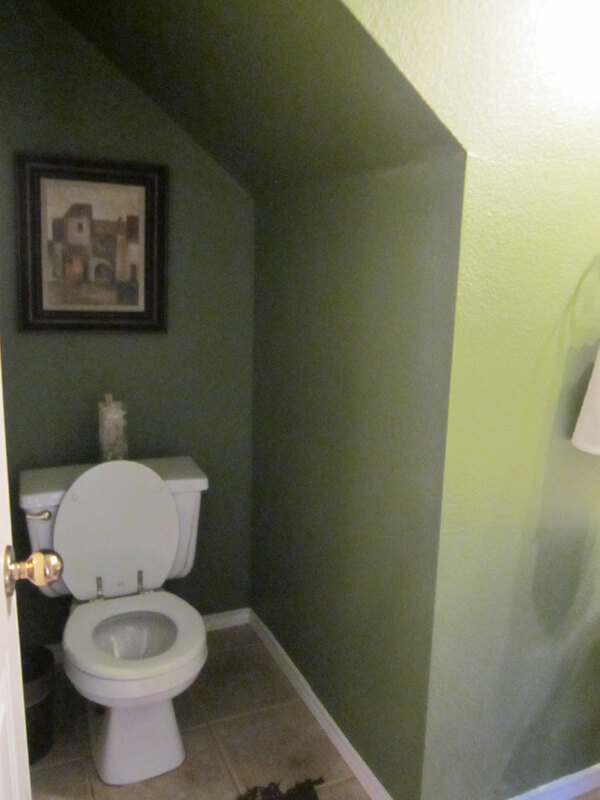 And I’ll leave you with the before and after of the paint job in this tiny little bathroom. Stay tuned for Friday’s post about the sink!